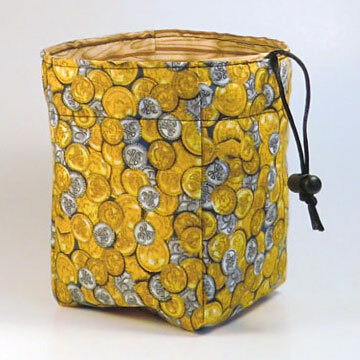 Sometimes a dice bag is more than just a dice bag. Sometimes…..it actually makes your game better. Two weeks ago, I probably wouldn’t have taken that statement seriously. Two weeks ago I would have told you that dice bags are all about function, bringing your “tools” to the table so to speak. Don’t get me wrong, much like many table top RPGers, I have a bit of a dice bag fetish. They can bring luck, or they can be “cool”. I’ve seen all sorts of make shift bags, boxes, sleeves and containers used to house the tools of our trade. I’ve used most of them through the years, from the ubiquitous clear plastic tubes that new dice are sold in, to the almost “official” feeling Crown Royal bag seen at game tables across the country. In every case, dice bags were utilitarian at the least and mildly interesting at best. That is, until I received my first hand-crafted dice bag from Dragon Chow Dice Bags. I had heard the name dropped a couple of times on some of my favorite podcasts. The bags seemed to be held in high esteem by gamers I both admired and respected. I thought, “Hmmm, this may be worth a look”. You’re probably wondering what I personally use for my dice right now. Or, more realistically, you don’t care at all what I use. Well, I’ll tell you anyway. I use a mitten. That’s right, a mitten. When I was 10 years old and first introduced to D&D in the early 80s, I started to accumulate dice. I needed a place to keep them. I had an old pair of pigskin mittens that were worn out, smooth even. I cut off the part that was meant to cover everything but your thumb, punched holes around the newly cut edge and poked a brown shoestring through them to enable it to be drawn tight. I made that mitten close to 27 years ago and I still have it. It’s my geeky little conversation piece. Problem: It’s just too small for a nearly 3 decade long dice collection so I needed a new bag to hold my second string dice. Next thing you know, I’m on Dragonchow.com checking out the hand made dice bags. The selection is downright impressive. There are bags with the Superman emblem, leaves, cartoon characters, coffee beans? You name it, it’s there. Then I saw it. The neatest little dice bag. It was black on the outside and looked like gold coins on the inside. What could be more perfect for a D&D nerds holster? Plus, it’s reversible. Ordering was a snap, they even take Paypal. Now, I just had to wait it out. I checked the mailbox each day diligently hoping the shipment from Canada would arrive. It took about 6 days to get to the midwest USA. Not bad. As I pulled out the envelope, I got my first little surprise. There was a hand written note from Lyndsay on the envelope flap; “Finally Its here!”. My sentiments exactly. I tore open the packaging and there it was, a beautiful little thing, soft, supple and really well made. Just holding it in my hand, I knew it would keep my dice content in between sessions. It’s lightweight and sturdy with a drawstring that can lock so the bag won’t come open. It’s simple, elegant and I’m proud to have it in my game kit. Best of all, it included a free D20 inside. What a great surprise. Not only that, but now, I can bring a dice bag to games that I don’t have to explain was once a childs mitten. Thanks Lyndsay, I really appreciate it and if you read this, best of luck to you in your business!